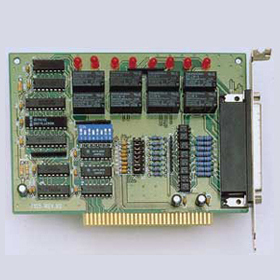 The 8 electro-mechanical relay outputs are addressed as a single I/O byte. Four of the relays are Form C contacts (Normally Open and Normally Closed) and the remaining relays are Normally Open. A red LED indicates each relay's ON/OFF status for monitoring. Breakdown voltage: 1000V AC/DC Peak min. The 8 opto-isolated DI channels are used for sensing digital inputs and provide 1,000VDC isolation. Each can be configured with AC Filter or Non-AC Filter by jumper settings.